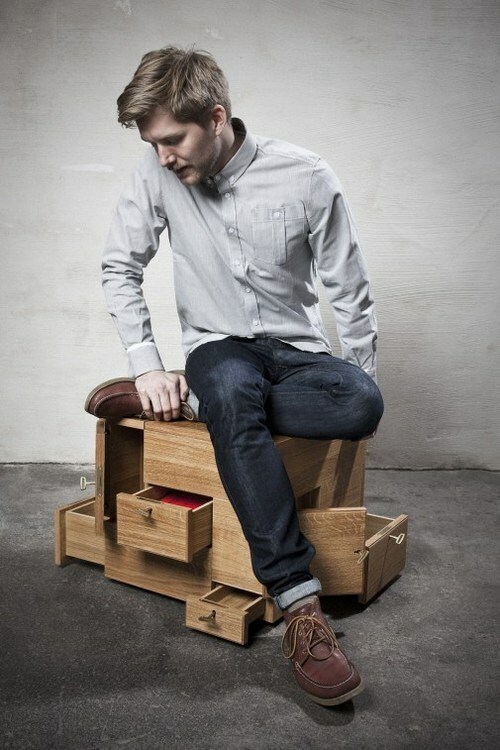 Sigurd Larsen is a Berlin-based Danish architect working within the fields of design, art and architecture. 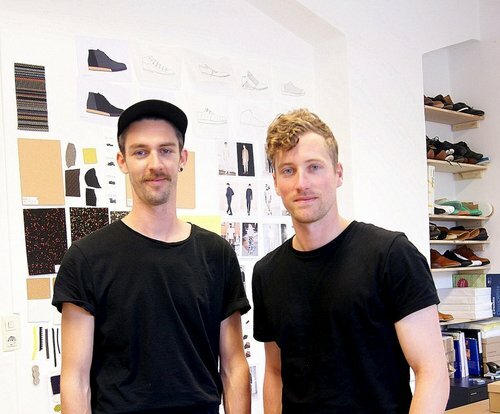 Three years ago, he founded his own design studio in Berlin and has recently realized projects for Voo Store, K-MB Agentur für Markenkommunikation GmbH and Zalando Labels. 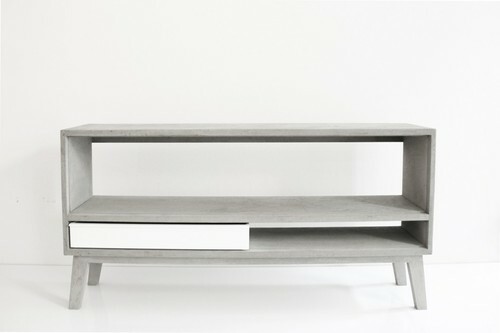 His furniture has been exhibited at fairs and galleries in Berlin, Helsinki, Hong Kong, Tokyo, Seoul and Shanghai. 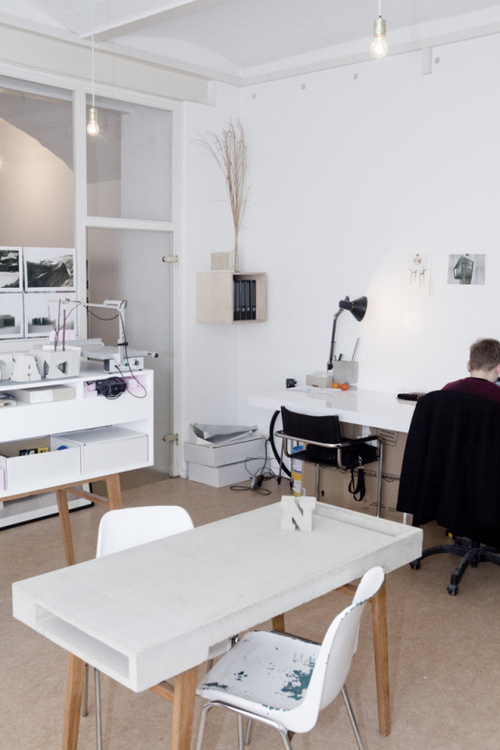 Awhile back, I met Sigurd at his studio in a beautiful, renovated building in Kreuzberg, where he shares his work space with fashion designer Hien Le and graphic designer Viola Schmieskors. With a catchy remix playing in the background, we sat down at a concrete table of Larsen’s own design to talk about his work. 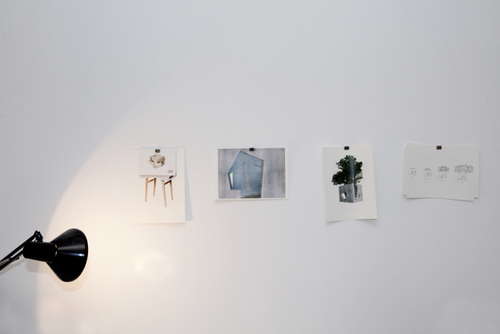 HOW DOES A DAY IN THE OFFICE OF SIGURD LARSEN LOOK LIKE? A typical day, like today, I arrive and I speak with my nice colleagues about where we are at the moment. We are four people in the office and we are always working parallel to each other on many projects. Most projects have a lot of short deadlines, so if we work on one project, we want to give full power on it, and the day after we will work on something different. 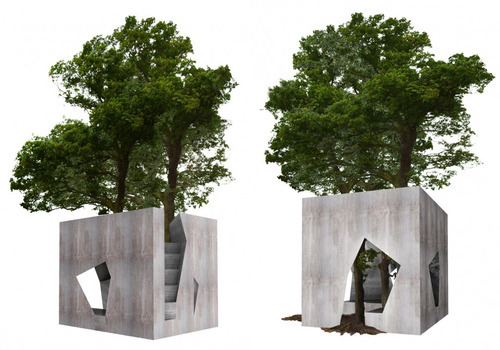 At the moment, my day is split between working on a 1500m2 building in France, a 10m2 Tree Temple in New Zealand, which is more like an art project, and pieces of furniture that will be exhibited in Beirut. So every day is different, as every project revolves around various disciplines. HOW WOULD YOU DESCRIBE YOUR SIGNATURE STYLE AND HOW DID YOU DEVELOP THIS? WHERE DO YOU FIND YOUR INSPIRATION? I don’t really intend to always have a certain style or to keep things between a certain frame work. It’s probably more exciting for me to always try to break that boundary and try to discover new fields. However, like most other designers, I developed a certain taste for certain materials. Sometimes there is a concept that inspires me and that returns in my designs. I like materials that grow more beautiful over time: concrete, wood and leather for example; they get nicer and nicer the more you use it. I’m very excited about that—that you can see those materials used over time and that adds character to the furniture. I also have a certain idea about saving space. Optimizing space is a topic that interests me and that is visible in many of the furniture pieces. I don’t have volumes that are left for nothing; I use every corner and everything is used for something. But I don’t think I can say my style refers to only one certain genre. I grew up in Scandinavia and studied in Scandinavia, so that might be something that feels natural for me to do, whether intentionally or not. 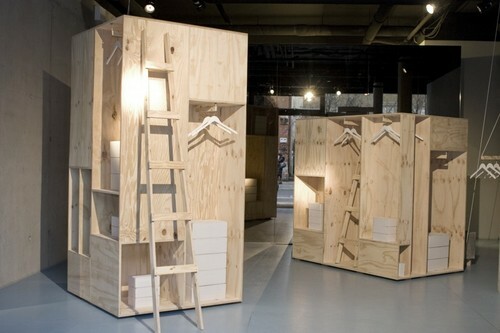 I think there are a lot of good Scandinavian role models to look at regarding architecture and furniture. Nevertheless, I can also find a lot of Japanese designers that I find very interesting. WHO DO YOU DESIGN FOR AND WHAT DO YOU WANT TO SAY WITH YOUR DESIGNS? Since none of the designs that I have done so far have been aimed at mass production, I hope that I design for people who buy a piece of furniture and keep it for many years. For example, this concrete table we’re sitting at, it’s very heavy, so you won’t get rid of it that easily. And some of the other furniture are very detailed and built of high quality materials making them also more expensive than furniture that you can buy at IKEA. So I have a strong feeling that people buy them simply for those reasons, for the quality of it and the level of details. I think that’s a good way of purchasing and consuming products—not buying to throw away, but rather that you invest in things you can keep for a longer time. When I start with a design, I think of a certain person or a certain room where this could fit in. 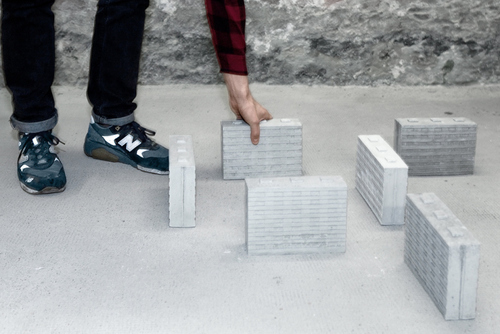 For me, part of the idea of working with concrete is to try to make the aesthetics of concrete more popular. This was not that hard; a lot of people like concrete already. But Berlin has a lot of plattenbau (the German word for buildings from the 70s, whose structure is constructed of large, prefabricated concrete slabs and often considered to be typical of the former East Germany), that are very well situated and they have a lot of potential to become really nice. Nobody has been taking care of them so they are not in a good condition. Now they are slowly becoming more popular to live in, so I want to be able to design a nice piece of furniture that actually fits into a rather unpopular kind of architecture. I am thinking about what furniture we could put into these houses so they would become interesting and attractive to a new generation, because there will be a generation shift eventually, and they will have a different relationship to these houses. So I think about what kind of furniture would actually come with this movement as people start moving into these houses. 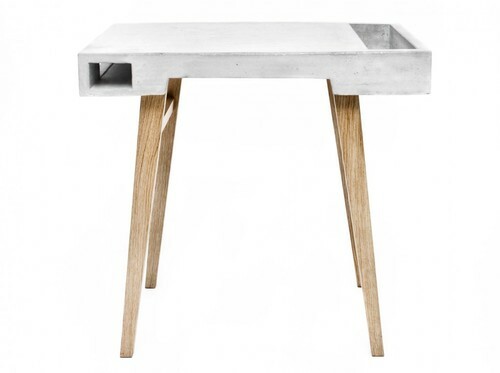 That was one inspiration for the concrete table—connecting it directly to a kind of architecture. HOW IS YOUR WORK VARIED? DO YOU APPROACH A PROJECT ALWAYS IN A CERTAIN WAY? The core of my profession is architecture, but there is nothing unique about an architect who also starts designing furniture. It’s a very motivating way of working. The process of every project is very different from each other. Sometimes it takes only a month from the first sketch to the final product and sometimes it rolls around in our heads, over our tables, and in our computers for a long time, before we are ready to build the prototype. I have several small notebooks, but I just sketch on whatever that is around me, so usually my table looks like a mess and I can’t find my sketches anymore. I don’t have this tidy, sweet little notebook, I just pull out a piece of paper and my sketches somehow turn into 3D drawings quite fast. Afterwards we transfer the drawings into digital construction drawings. I cannot live without my laptop. No matter where I am, I open my laptop and I look into something that looks familiar to me, so that is my, sort of, fold out home. Being an architect also varies in large scale projects, where it’s simply not possible to go deep into details of how the wood meets the concrete for example, but with small scale projects, like furniture, you have to know every little corner of the project, so it’s a nice variation as well. I definitely prefer to be able to work with both. I’m happy to be able to alternate disciplines; they all learn from each other. It was my ambition to work with various disciplines and, at the moment, that works out. My biggest achievement is that I’ve managed to make my job so varied. I have wanted to be an architect for all my life. Even if I would win the lottery, I would definitely stay an architect. But then I might also become a client and spend some of that money on realizing my designs and finance experiments to improve my designs. The only hard part of my job is that before a project is really finished, you’ll never know if a project will be cancelled. It’s always the saddest moment for an architect if a project is cancelled, especially if a lot of people have been working on it for a long time. I have several on-going projects that I’ve been working on for the past year and a half and they are still not finished. They are now approaching the last phase, but you still never know if someone says no last minute; that is a tough moment for the architect. My ambition for the future is to try to always finish what we have started. HOW IS YOUR HOME LIKE YOU? WHAT DO YOU LIKE ABOUT BERLIN? I think when I moved to Berlin I imagined myself living in one of these beautiful altbau buildings with high ceilings and stucco details, but when I came here, I thought, “maybe I should try to live in plattenbau.” So I started investigating where, how, and if it was possible and I realized it was not as cheap as I thought. I ended up in an altbau flat in Kreuzberg. It’s a top floor flat and it’s really bright. So I sacrificed the beautiful stucco and beautiful floor to a great view and a lot of light. All day in my flat is a nice experience, because there are windows in the ceiling and in all directions, so the light changes during the day and we have amazing sunsets. The appartment is not built in a particularly beautiful way, but I tried my best with the interior; I have a lot of my own prototypes standing around. I came to Berlin because of the job I got here, but I must say I was in Berlin quite often before. Berlin and Copenhagen are very well connected and it’s very attractive for people in Copenhagen to come to Berlin. The two cities are very different from each other, almost opposite, but still so close and well connected. So it’s a nice experience to arrive in a city so close by and everything feels completely different, everything looks different, and people act a bit differently, and people dress a bit differently and so on. Copenhagen is like one third the size of Berlin, so Berlin is the first really big city that you meet when you travel outside of Denmark. In that sense it gives you something that Copenhagen doesn’t give you, a feeling of a big metropolis with everything that is included. 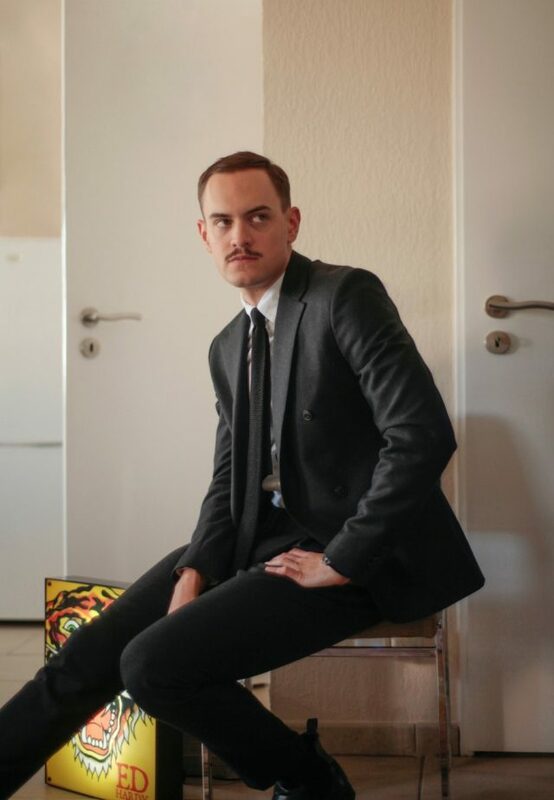 There is also a good infrastructure within the whole art scene here and there’s an upcoming fashion scene, a design scene, and a big art and music scene here, which gives you a lot of possibilities to collaborate with other creatives and make multidisciplinary work. The one thing I miss in Berlin though is the ocean. Before I never lived more than a few hundred meters from the ocean, so that’s kind of a challenge for me when it 25 degrees here in summer.